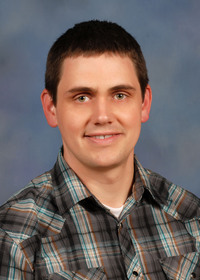 The information presented on this page was originally released on May 14, 2012. It may not be outdated, but please search our site for more current information. If you plan to quote or reference this information in a publication, please check with the Extension specialist or author before proceeding. Million Bells is one of my favorite flowering plants in the early summer. I think you’ll find this plant to be a good choice for the summer landscape in your Mississippi garden. Million Bells are known botanically as Calibrachoa, and you may see them called by either name in garden centers. Regardless of what name they go by, you need to have some of these garden performers in your landscape. 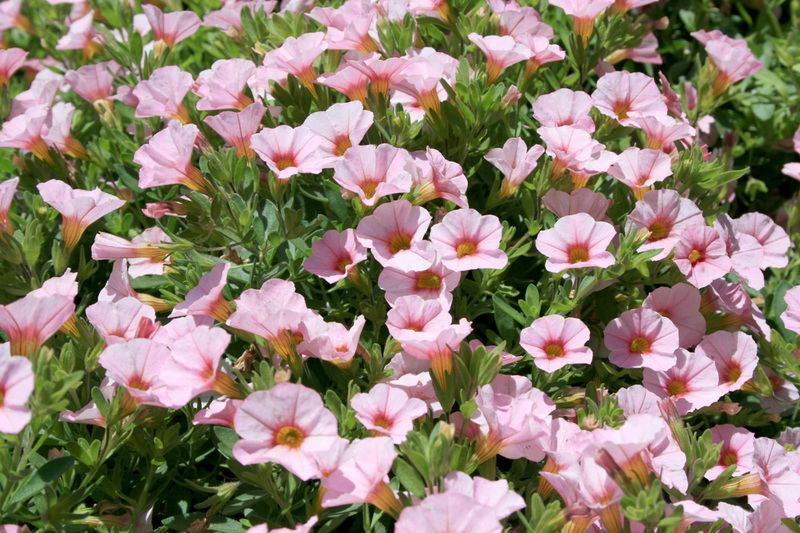 Million Bells cannot be beat for full-sun locations where even petunias seem to fade out later in the summer. In full sun, the plant will live up to its name by producing an unbelievable number of colorful flowers approaching an inch in diameter. The plants grow up to 10 inches tall and have trailing stems that will spread to create a beautiful groundcover mat or sprawl over the edge of containers or hanging baskets. If the plant gets a little out of hand, prune it to generate more growth and, more importantly, more flowers. It will tolerate part shade, but flower production will decrease according to the level of shade. Many selections of Million Bells are marketed under different series names. All are available in shades of blue, violet, purple, magenta, red, orange, bronze, yellow and white. Though it puts on a show of literally hundreds of flowers, deadheading is not required, as the plant is self-cleaning. Million Bells do not grow as vigorously as petunias, but they tolerate the summer heat better and have few insect pests. Unlike petunias, the leaves of Million Bells are not sticky. 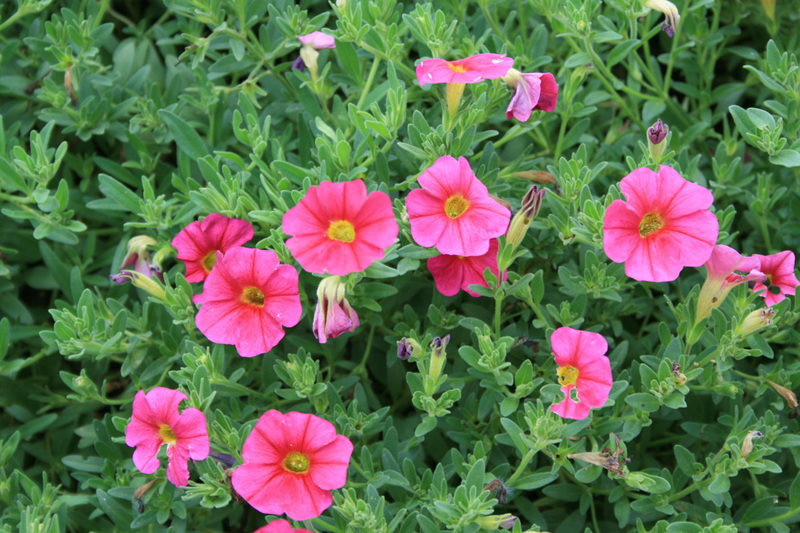 They also tolerate drought better and have a bushier and more compact growth habit than do petunias. Plant breeders have been hard at work and have introduced a really wonderful Million Bells hybrid called Petchoa. This hybrid has all of the best growing traits from both Million Bells and petunia. Petchoa has the vigorous growth and large flowers of petunias; it also has prolific flower production and high tolerance of tough growing conditions in the hot and humid summer months of Million Bells. Million Bells are suitable for both the landscape and containers and will create landscape interest wherever they are grown. They are easy to care for in hanging baskets, containers and landscape borders, or as accent ground covers in small areas. Million Bells is a tender perennial that may overwinter in coastal Mississippi. During the past few winters, I heard of one garden center where Million Bells tolerated several freezes in large, unprotected containers. If you are planting Million Bells in the landscape, amend the soil using 3 inches of organic matter to improve drainage. Finish the planting with a good bark mulch to keep the soil cool, slow evaporation and retain moisture. This plant may actually thrive on a little neglect. Water only when the top of the soil feels dry. Too much water can lead to root rot problems, especially when planted in the landscape. In the landscape, Million Bells needs only light fertilization using a couple tablespoons of good, slow-release fertilizer. This controlled-release fertilizer will maintain floral production in the landscape. When growing them in containers or hanging baskets, feed every other week with a 20-10-20 or 20-20-20 water-soluble fertilizer. This helps keep the plants’ prodigious flower production going strong.